Tesla‘s stock surged as much as 11% on Thursday following the company’s strong quarterly earnings report. The share spike has cost short sellers $US1.1 billion in a single day, according to data from S3 Partners. The short squeeze marks a temporary victory for Tesla CEO Elon Musk, who has been locked in months-long battle with his company’s sceptics. That resulted in a mark-to-market loss of more than $US1.1 billion for short sellers, according to data compiled by financial technology and analytics firm S3 Partners. 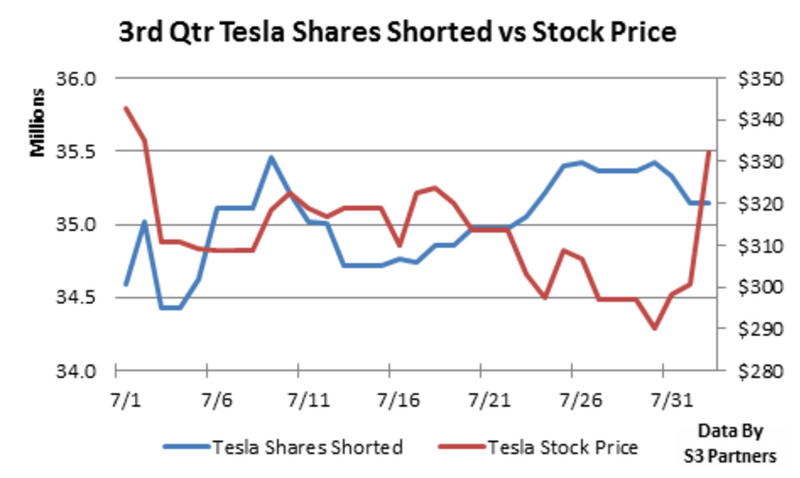 The depth of the loss has a lot to do with just how heavily positioned Tesla sceptics were for a share-price drop prior to the earnings report. 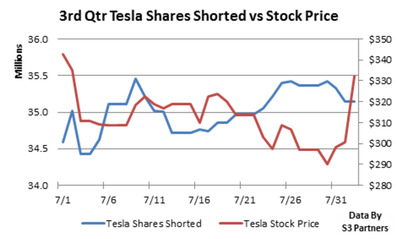 With short interest – a measure of wagers a stock will fall – at $US10.53 billion, Tesla was far and away the most shorted company in the US stock market. To fully understand what a victory this is for Musk, one must be familiar with his months-long crusade against Tesla short sellers – which he usual wages over Twitter. “If you’re short, I suggest tiptoeing quietly to the exit …” he taunted in May, following Tesla’s previous earnings report. At this point, it’s too early to declare a winner in this battle for the ages. After all, Tesla’s strong quarter has again boosted forecasts around the company, and further raised the firm’s valuation. And with higher expectations come a greater chance for disappointment. Stay tuned for the latest twists and turns in this saga.